Exactly one year after the launch of the game we present you the second season of Innovetica. And fittingly we can announce that Innovetica won silver in the category “Games” at the Best of Swiss Apps Awards. We are happy about the honor, but we don’t rest on our laurels and continue to work diligently on Innovetica. 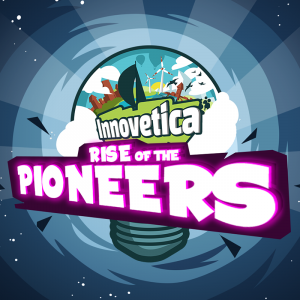 With the biggest update so far, “Rise of the Pioneers”, Swiss pioneers are making their way into Innovetica. So you can look forward to interesting duels with innovative characters. Challenge them to exciting competitions. Are you new to Innovetica? 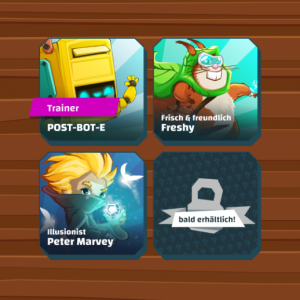 The postbot will show you how the game works. Freshy is always ready for a challenge. Let yourself be enchanted by Peter Marvey’s magic when you compete against him. You’ll find the pioneers in a redesigned menu. New challengers will be available soon, so keep checking back! 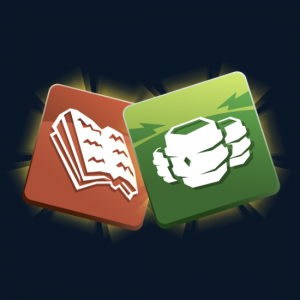 Action cards as new card types add new features to the game and increase strategic depth. At first, only a few selected cards are available, the rest will be published on an ongoing basis. So you always have plenty of time to get to know the new Action Cards and take them into your deck. The Action Cards are the prelude to the Innovetica Masters 2019. More information will follow. In the game you can get them randomly in flowpacks. But there will be other ways to get them soon. You can be curious! If you want to find out more about the Action Cards now, you can find all event and scenario cards in our card catalogue. Innovetica is more fun when you play it with friends. That’s why we’ve made it a lot easier to add new friends. Now you can simply scan the friend code and become friends with each other in the game. We’ve redesigned the profile section. It is now even more clearly arranged and you can find interesting statistics and awards for your games in Innovetica. Last but not least, the settings will give you more options to customize your gaming experience. For example, based on your feedback, you now have the option to be alerted by vibration when it’s your turn to play. In addition, there are many small improvements that you will discover as you play. Pioneers: Have fun collecting, trading, playing!